March in Scotland is perhaps a little early in the year for a field class. Yet the weather on the island of Islay, the home of peaty malt whisky, had been kind to the teachers and students of Tellus III, a distance-learning course in geology and physical geography. The class was on Islay for field instruction, prior to course assessment. Sadly, on my main instruction day, a gale blew in from the Atlantic, and my words of wisdom on the glacial landforms of the island were often lost on the wind. Yet the students will remember the day for a long time. We found shelter in a gravel pit where we could see, sketch and interpret glacier-push structures in the deposits. But the local Highland cattle had also sheltered there – the slurry on the pit floor made that clear. Just as I was summing up, a particularly violent gust gave me a face-full of bull**** and much amusement to everyone else. It was not my finest field teaching experience. My overall impression of the field course was altogether more positive. I am new to Stockholm University, joining as adjunct professor after 30 years in UK teaching and research. A welcome opportunity to focus on my research in geomorphology, with the bonus of field teaching. I was on Islay helping Prof. Alasdair Skelton, director of the Tellus distance courses in Earth Science, and a Scot from Inverness. This corpus of courses is starting to attract students from across Europe and it works like this. Tellus I, II and III provide the hook, with a wide range of introductory on-line course materials and a lively field trip to classic geological sites in Scotland. The second year brings a step-change in difficulty, with remotely moderated practical exercises on tectonics, minerals, rocks, maps, landscape development, earthquakes and structural geology. The second year concludes with a shift of emphasis to practical geoscience, with lab and field assignments. And brings this Tellus class to Islay for 10 days. The final year is a step up in difficulty again, with courses in tectonics, petrology and climate. The demanding program concludes with a final year project. The students on Islay clearly valued the Tellus courses. This was a mixed bunch, mainly based in Sweden through partner or family links, with a straight gender split, ages from 21 to 40 and a diversity of backgrounds and outlooks. Steve, the South African, reckoned that Tellus was time-efficient, allowing the student to move at their own pace. His goal was a job in applied geology and this degree was his chosen route. Linda had a family and no simple way of following a degree from her home in rural western Ireland. She had considered the UK Open University distance courses but judged that Tellus was much better balanced, with a wider set of course options backed by intensive lab and field courses. She found the quality of feedback to be impressive and she enjoyed the challenge of independent learning – Linda hoped to move into a research-based post. Eemu, from Helsinki, valued the ready accessibility of the course and the possibility of putting in bursts of intensive activity whenever his circumstances allowed. Course delivery in English and Swedish, combined with low cost, was a help to all. This teacher rated the students highly – these were well-informed, motivated and curious learners -and quite a contrast to more laid-back university-based participants on previous UK excursions. 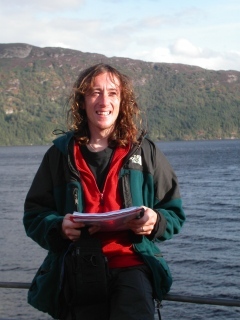 And Alasdair Skelton agreed, often finding distance learners better prepared and more committed to geology learning. The students complained that employers need to wake up to the qualities that the distance learner brings to a degree qualification – independence, stickability and flexibility – and stop regarding university-based degrees as necessarily superior. So it’s a puzzle why Tellus is not more widely known and promoted. accessible – to those who cannot for personal, financial or others reasons come to Stockholm University to study – and offers great scope for future topping up skills or retraining. Tellus also links seamlessly with the university-based study programme. With the precedent established by Skelton that classic field areas anywhere in Europe can be the basis for excellent teaching on specific themes in Earth Science, and with SU access to field centres at Tarfala in northern Sweden, NEO in the Peloponnese in Greece, and other top field locations, Tellus shows us that distance learning can mean so much more.